Graduated in 1985 from the University of Warsaw; did Ph.D. in Biochemistry (1991) at the Nencki Institute and postdoctoral training in 1994-1996 at the McGill University, Montreal, Canada. She returned to lead a research group at the Nencki Institute where she has been ever since. In 2001-2002 was a visiting scientist at the Brain Research Institute, UCLA, USA. In 2003 she received a national Professorship and became a head of the Laboratory of Transcription Regulation; in 2013 created a new Laboratory of Molecular Neurobiology. protumorigenic polarization of microglia have been demonstrated by her group. Currently, her group studies a therapeutic potential of epigenetic and short interfering peptide inhibitors for the treatment of gliomas. 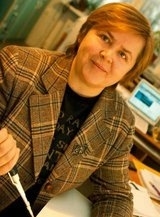 Prof. Kaminska promoted 23 PhD students. She is an elected member of 3 Polish Academy of Science Committees: Neurobiology, Cell Biology, and Biochemistry and Biophysics. Funding: PI in more than 44 national and international research grants, including 6th FP EU, NATO collaborative project, twice bilateral Polish-German grants in Neurology, twice bilateral Polish-French grants in Cancer Biology, National Science Center MAESTRO and Symfonia3 grants, 3 R&D grants; hosted two FP7 Marie Curie Reintegration grants, is a member of FP7 EU Initial Training Network NeuroInflammation. Published more than 105 publications in PUBMED journals, and 11 book chapters; 4167 citations, H-index = 38 (source ISI). She is the initiator and co-organizer of the Brain Tumors: from biology to therapy conference, 2012, 2014, 2016, 2018 in Warsaw.